It must be so special for Van Morrison to describe his beloved as Tupelo honey in his song "Tupelo Honey" (1971). Well, which other honey varietal you know is also a song? As the song declares: "She's as sweet as tupelo honey. She's an angel of the first degree… She's as sweet as tupelo honey. Just like honey from the bee." Often called "The Queen of Honeys" and "the sweetest liquid gold", Tupelo honey is produced from the White Ogeechee Tupelo trees. With a high fructose (44% approx. ), low glucose (30% approx.) ratio, this honey, unlike most honeys, resists crystallization and stay as a liquid for years. The high fructose content of this honey allows the body to absorb it more quickly initially but releases energy over a longer period of time than other honeys; it is an ideal sweetener and a more lasting source of energy for athletes. Doctors also often recommend Tupelo honey for some diabetics. 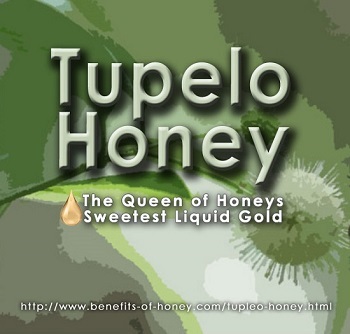 Tupelo honey is a rare and prized honey. It cannot be produced all year round. White Tupelo trees have a very brief flowering season from early April to early May. Their flowers are also very delicate and are easily knocked off from the tress by heavy rains. The Ogeechee River, the Apalachicola, and the Chattahoochee River Basins of northwest Florida are the only places in the world where Tupelo Honey is produced commercially. Beekeepers line up their hives along the swamp beds. The bees collect the nectar from the Tupelo blossoms in the swampy areas during those few weeks and return to the hives produce the light amber honey. Harvesting and extracting Tupelo is labor-intensive and tedious. Many beekeepers go to great lengths in managing the hives from boats in hot weather. Once the flowers start to blossom, all the existing honey collected would have to be emptied from the hives and clean empty beeswax combs replaced to prevent mixing of Tupelo honey with other honey collected from other flower sources. And to obtain the purest Tupelo honey, beekeepers must harvest the honey immediately after the Tupelo flowers start to fall off. Due to its challenging production process and high demand, this exquisite honey often commands a premium price. A mellow honey placed on the opposite end of the honey scale to the bold buckwheat honey, Tupelo honey is delicious, has a delicate yet distinctive bouquet. It pairs perfect with barbecue sauces, buttered toast, strong cheeses, cakes and ice cream. Fans of Tupelo honey simply love the subtlety in its sweetness and its fruity hints. As many of them would say, "Life is too short not to eat Tupelo honey". 1. If you are residing in Singapore, check out the Tupelo honey in: Bee Healthy. End of "Tupelo Honey - Queen of Honey". Back to "Exploring Honey Varieties!"